SIS LIVE broadcasts Rugby World Cup-satellite uplink trucks. 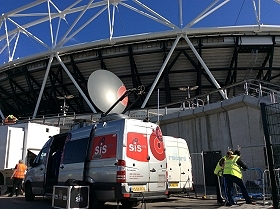 Milton Keynes, September 2015: Connectivity experts SIS LIVE, kicked off the Rugby World Cup by successfully delivering broadcast coverage of the Barbarians v Samoa match at London's Olympic Stadium using its dedicated media fibre and uplink systems. SIS LIVE’s media network provided high quality, low latency HD video coverage of the game. SIS LIVE was able to demonstrate the resilient nature of their connectivity offering with satellite and fibre both used to deliver the live action. The feeds were distributed and managed by SIS LIVE’s main broadcast network operations centre (NOC) and teleport located at MediaCityUK in Manchester, with a disaster recovery NOC at SIS LIVE’s Milton Keynes headquarters. The stage is now set for the main event and SIS LIVE’s key role in providing all feeds from 48 matches, around England and Wales at 13 different venues. David Meynell, managing director, SIS LIVE, said: “The successful trial of our resilient coverage of the Barbarians v Samoa game is a great start and the first live usage of our new fibre venue networks ahead of what promises to be a keenly-followed World Cup. The match, which resulted in Samoa 27, Barbarians 24, was broadcast on ITV4. SIS LIVE is well established as Europe’s largest supplier of satellite uplinks and is fast establishing itself as a major UK broadcast media fibre supplier. Fibre links are installed at all World Cup venues to guarantee the same fully comprehensive live coverage from every game. SIS LIVE will also provide 10 single and 3 dual antenna uplink trucks, with over 1000 hours of satellite capacity. In addition, SIS LIVE has installed microwave links at Twickenham, Olympic Park, Millennium Stadium and Wembley. Host broadcaster ITV selected SIS LIVE to supply all connectivity services throughout the hotly-awaited tournament, which features teams from the top 20 rugby nations and kicks off on 18th September.